Shooting backstage is always fun, it is the main process room where models are getting dressed up & all not so fashionable things happen. Everybody is running here & there, make up artists are working on giving touch ups at the same time designers/stylists are giving the final touch to the collection, before the models go for catwalk. So I had a great opportunity of shooting backstage for Vogue India Fashion Fund winner Dhruv Kapoor’s Autumn/Winter 16 collection at recently happened Amazon India Fashion Week in New Delhi. The collection was blend of sports-luxe which is also his signature style (Remember the jumpers with slogans ‘Cool’ & ‘India’ on Deepika Padukone & Ranveer Singh respectively in Vogue India) mixed with evening wear details. Fur with exaggerated sleeves, unfinished hems, buckle straps, sequins & combat boots were the main highlights of the collection. There were ace photographers like Mehtaab Mann, Manasi Sawant of Elle India & Jimmy Granger shooting the backstage portraits & beauty shots with humongous equipments, directing the models confidently for the perfect shot. I was very much fascinated by seeing top models like Lakshmi Rana, Sony Kaur & Smita Lasrado to name a few posing for the camera backstage. I wanted to capture the ongoing backstage madness so this photo essay focuses on the action going on behind the scenes-making of a successful fashion show. 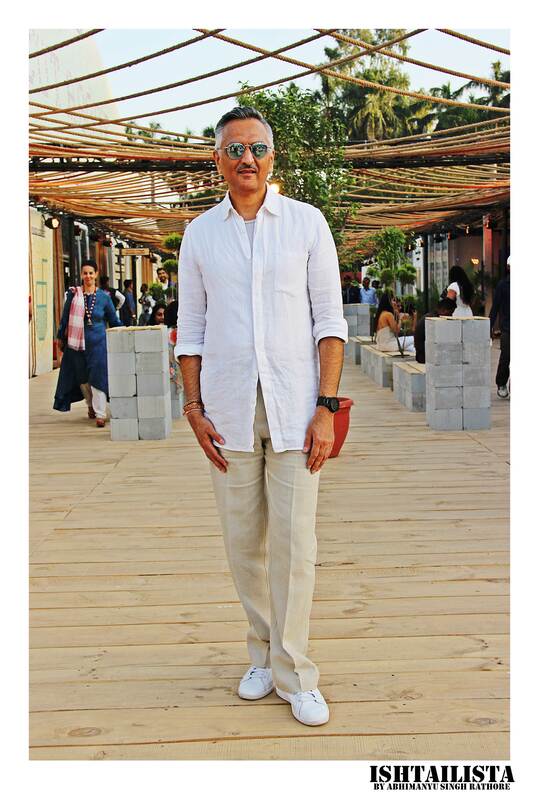 You never go wrong with the classics whether it’s the crisp white shirt or the white sneakers. 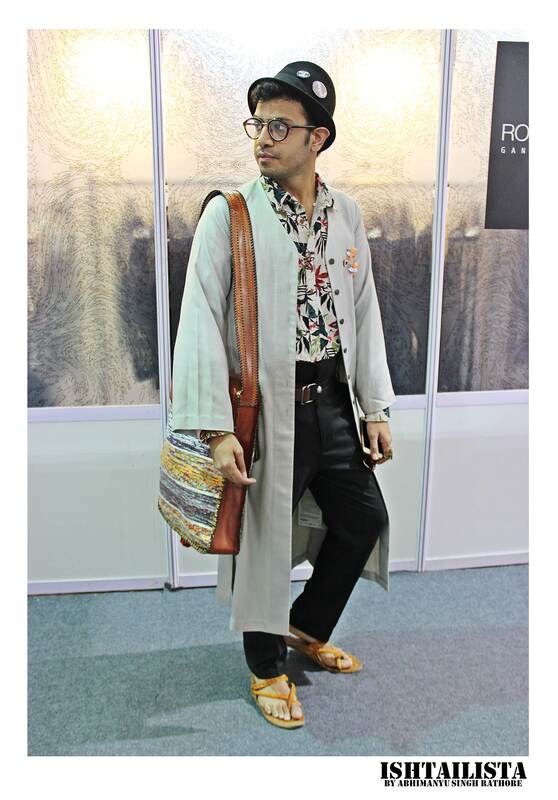 His label ‘Anaam’ is definitely one to follow and so is his style. I find this particular style very much inspired by the London Grunge in the 90s. 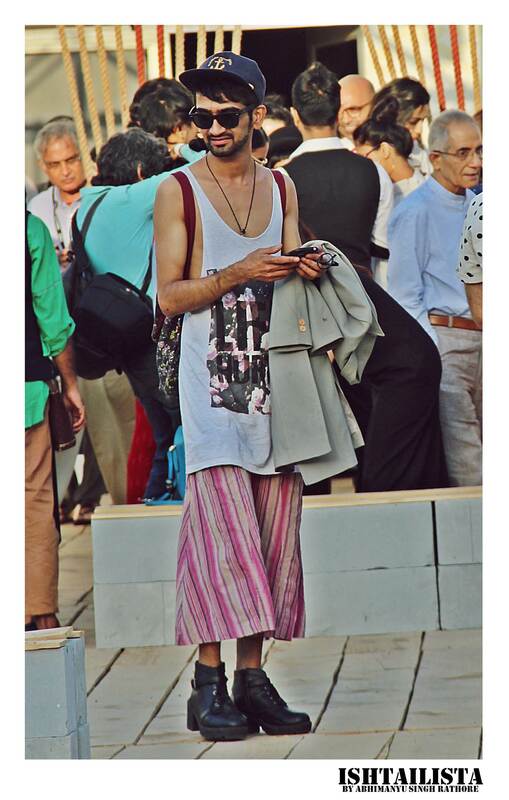 Loved the way he paired vest with wide legged trouser along with dark boots. The trophical Shirt styled with high waisted trousers is unique & very verve. Mayank Chauhan, Visual Designer at Amazon India. Thinking of pairing stripes & checks? Well this can be a very good example of how to style these two classic patterns. Yes even men can carry florals. 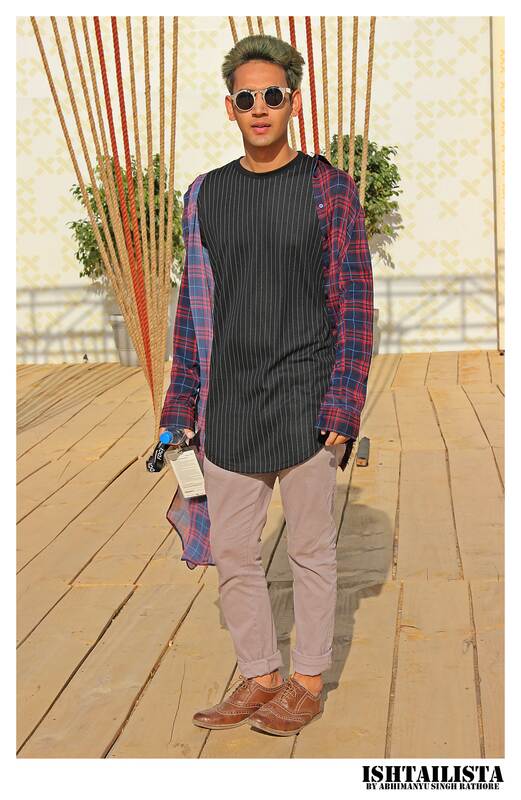 Loved the way Ishaan played with the tones of navy blue and brown. 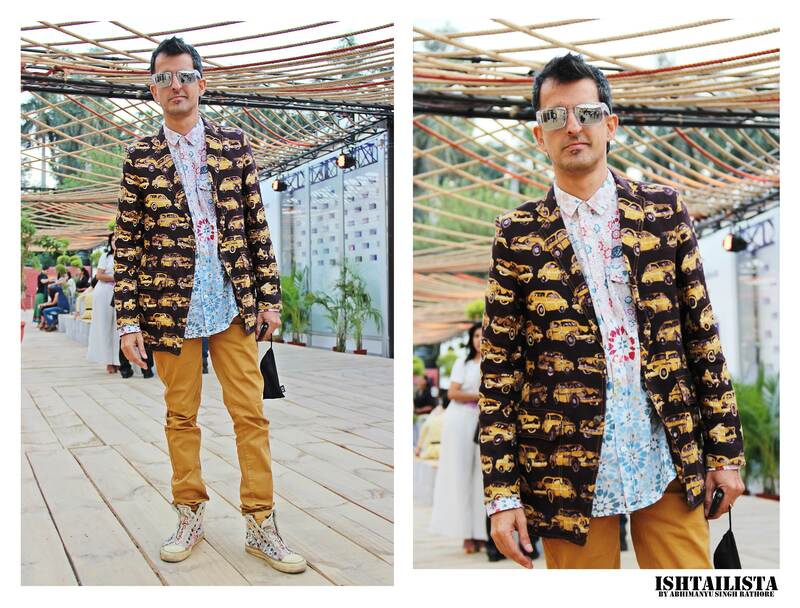 Loved the quirky printed jacket paired with printed shirt and tan chinos. Did you noticed the stunning Ed Hardy Shoes? 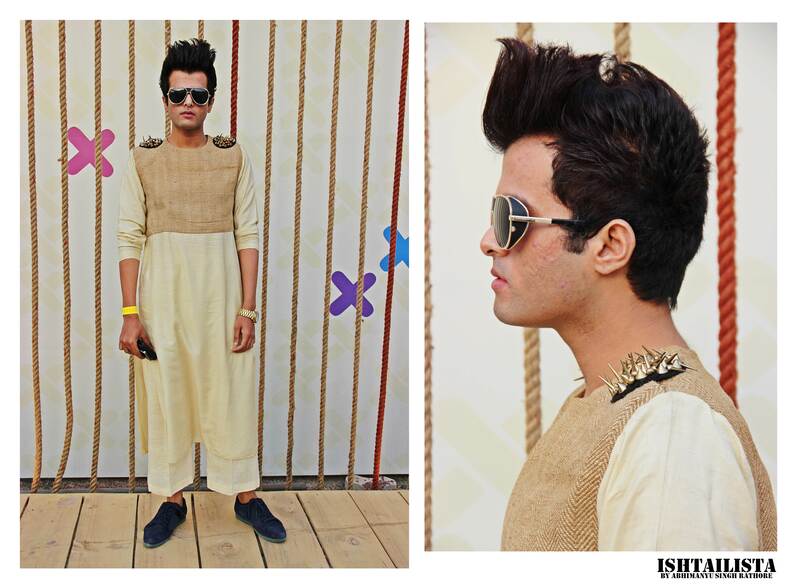 Thumps up to Rahul for artistically transforming the typical ethnic kurta into something ultra modern and futuristic. Loved the statement glasses and ofourse the punk studs on the shoulder. Ujjawal Dubey, Fashion Designer. 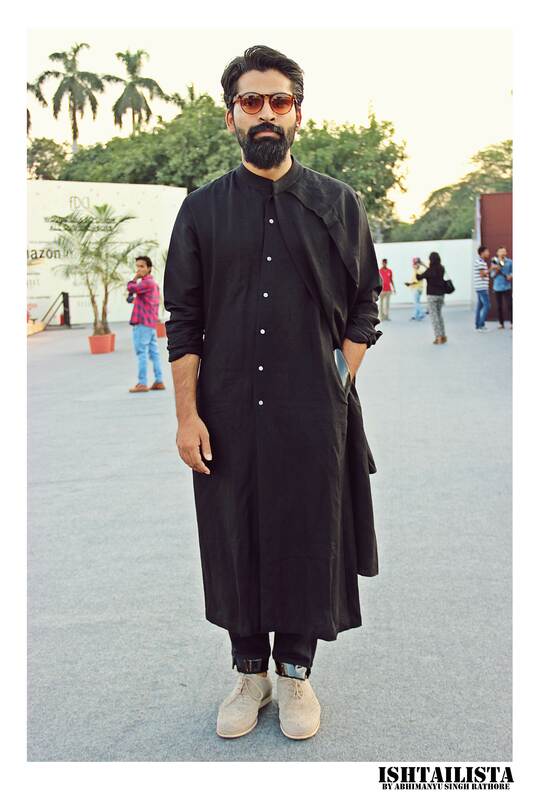 Call it a long shirt or kurta I love the entire black on black styled well with grey brogues. You might be thinking that it’s a jumpsuit but it’s not. 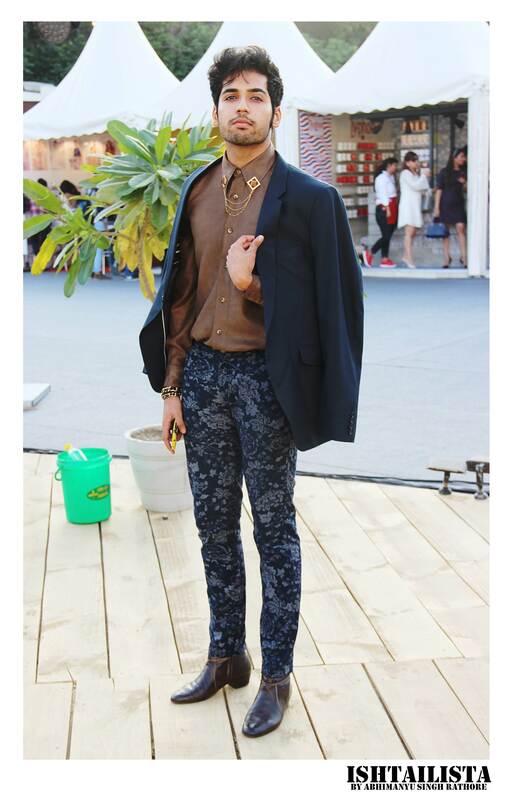 Fashion Stylist Kalee brilliantly paired the printed shirt with matching printed trousers. 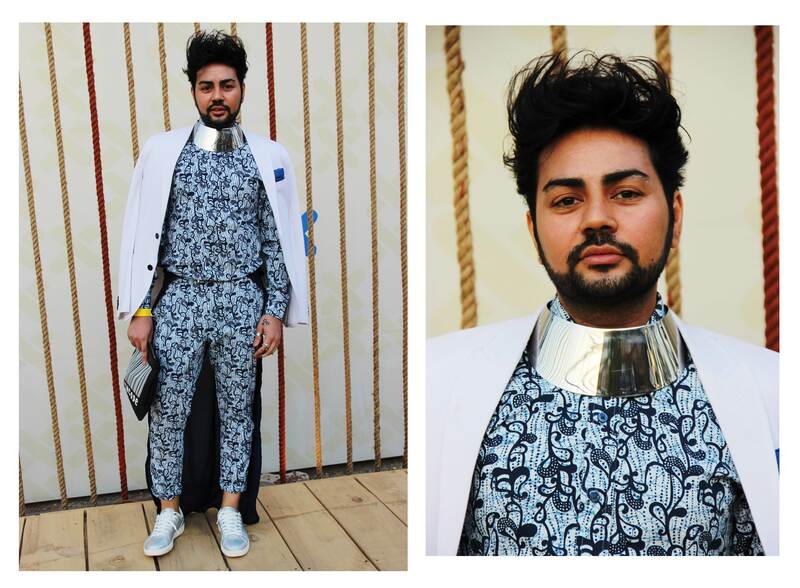 The metallic tribal neckpiece definitely makes this guy a complete STATEMENT maker.